When Moscow officials recently banned swimming in half of the city's outdoor bathing spots because of high levels of microbes and chemicals, the news underlined a perpetual worry: that the water here leaves a lot to be desired. For most residents of Moscow and St. Petersburg, the most populous and cosmopolitan cities in the country, that concern typically isn't over a swim in a local pond but the water coming out of the kitchen faucet. The ban announced this past Friday for five of Moscow's water recreation sites highlighted what even federal officials acknowledge: There is a lot of cleaning that has to happen between the water's origin and the tap. What's more, consumers distrust the government's claims, dislike the taste of tap water and buy or boil much of their drinking water, an approach that isn't entirely without cause. The federal government's latest report on water reservoirs and tap water indicates that seriously contaminated water supplies are intensively — and successfully — cleaned by the time they reach apartment buildings and consumers. Interviews with environmental experts, however, suggest that decrepit pipes in those buildings and excessively dirty reservoirs make the drinking water situations in both Moscow and St. Petersburg less than optimal. "Providing the population with quality drinking water is one of the top problems facing government policy on maintaining the health and improving the quality of life for Russian citizens," the Federal Consumer Protection Service said in its most recent annual report on public health conditions nationwide. Even the head of the Federal Consumer Protection Service himself — the nation's top public health official — doesn't drink water from the tap. When Gennady Onishchenko responded to a reporter's question about what type of water he consumes, he said he drinks "only tea brewed with water from a water cooler." "It's possible to drink straight from the tap, but if your budget allows, find a good [brand of] drinking water in the stores that works with your needs and health," he told Komsomolskaya Pravda in an interview published in August. Sending mixed messages about the safety of drinking water, Onishchenko said in the same interview that "in Moscow, water from the tap is some of the best in Russia and, I assure you, better in quality than tap water in European countries." One of the nation's leading researchers on the quality of drinking water has a similar view. Yet Moscow's water rates well overall, she said. "In Moscow, tap water meets the Russian Federation's modern hygiene standards and the World Health Organization's recommendations for almost every indicator — microbial, parasite, radiological and chemical," Mikhailova told Gastronom.ru in November. The federal report doesn't say what chemical or biological contaminants were in the affected samples. Researchers with environmental groups in St. Petersburg and Moscow contacted for this article also didn't know about the contaminants in detail, and the Sysin Institute's Mikhailova wasn't available for an interview. Yet, based on Mikhailova's previous interviews and other articles in the Russian press, problem substances can include excess chlorine from the process of cleaning water supplies through chlorination, Giardia and other microbes that wreak havoc in the intestines, and excessive iron. From high levels of microorganisms to excessive chemical contamination to just poor taste, the tap water in the two cities is an ongoing public health issue. Both environmental experts and the Federal Consumer Protection Service suggest that a major part of the problem is literally at the source of the water itself. In the service's last annual report on public health, published in July 2011 and analyzing 2010 conditions, there is a worrisome picture of water sources for Moscow and St. Petersburg drinking water. In Moscow, all six of the city's surface-level sources of water failed to "meet the requirements in the law due to a lack of sanitary control zones," the report said. In addition, close to 70 percent of the samples from the water system's sources exceed hygienic norms by 1 1/2 times. That actually was an improvement from the previous year, 2009, when peat bogs burned outside of Moscow and the figure was about 86 percent. It also was a substantial improvement over 2008, when the figure was 77 percent. Mosvodokanal, the Moscow city government unitary enterprise that provides tap water, cleans the water supply and runs the waste water and sewage systems for the capital, declined to answer questions submitted in writing about its own figures for water quality in both reservoirs and tap samples. It also declined to describe complaints that it has received about water quality. It did say it has an extensive system of water supply for Moscow's estimated 13 million inhabitants, with 14 "regulated reservoirs." It didn't name the bodies of water that feed into Moscow's water supply, but according to various reports, there are six ground-level bodies of water with that role, including the Khimki reservoir that stretches from northern Moscow, near the Vodnoi Stadion and Rechnoi Vokzal metro stations, into the Khimki section in the Moscow region. Mosvodokanal also said in its reply that it operates four water-sanitation plants and 8,400 kilometers of sewage networks. St. Petersburg also has a mixed record. 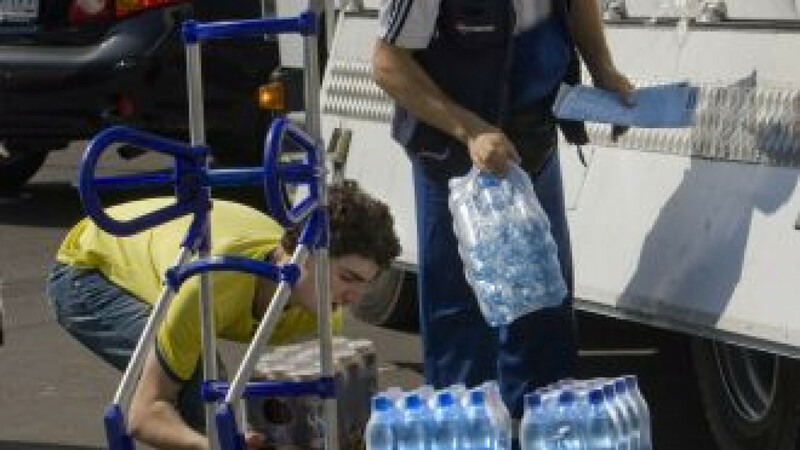 In the federal public health report, St. Petersburg, with its infamous infestation of the Giardia parasite in its water supply that causes diarrhea and upset stomach, was one of the worst-performing regions in the country for "microbiological" contamination of water supplies, with 36 percent of samples exceeding standards by 1 1/2 times. Only Chechnya, with a similar figure, and Karachayevo-Cherkessia, where more than 50 percent of samples exceeded standards, performed worse. Famous victims of St. Petersburg's water include the composer Pyotr Tchaikovsky, who reputedly died from cholera after drinking unboiled water there in 1893. In St. Petersburg, the Neva River is full of the Giardia parasite, which can cause moderate symptoms such as diarrhea to full-blown illness requiring serious medical treatment. For years, visitors to the Northern Capital have been told to avoid the tap water: Don't drink it, eat salads washed in it, use ice made from it, brush your teeth with it or even gargle in the shower. Now, with the implementation of more-modern treatment systems, the water quality has improved, according to St. Petersburg Vodokanal, the company that runs both the water sanitation and supply systems and sewage systems for the city. Citing the Federal Consumer Protection Service, Vodokanal spokeswoman Natalia Ipatova said in a written response to questions that "drinking water in St. Petersburg is safe." While acknowledging that almost all of the city's supply — 98 percent — comes from the Neva River, the company says it takes ardent measures to clean it. Giving up liquid chlorine treatment in 2009, it now uses ultraviolet radiation, she said. In addition, the city has measures in place to prevent contamination. "Today in St. Petersburg, 94 percent of the waste water is cleaned," Ipatova said. According to the federal report, Moscow and St. Petersburg actually performed well on tap water. It highlighted the cities as two of six areas in the country — the others were the Kemerov region, North Ossetia, Kabardino-Balkaria and the republic of Altai — "in which there was a successful situation with supplying water of good quality." It also praised a fix in 2010 to Moscow's system for delivering hot water, which comes from a centralized municipal source for most of the city's buildings. That was a positive sign given that 31 areas of the country where the agency took samples failed to obtain an average score on sanitary and chemical standards. Seasonal weather conditions — especially the spring thaw — also can worsen the water supplies to the point where local water treatment plants can't cope. This May, as huge amounts of melted snow and ice filled the country's sewage system, Onishchenko actually advised the public to drink only bottled water or boil tap water, Interfax reported. To have quality tap water free of contaminants, the water must be protected at the original sources, said Ivan Blokov, an environmental campaign manager in Greenpeace's Moscow office. "You can never clean or purify water to the extent that you can meet all of the standards," he said. Instead, industrial, agricultural and construction pollution should be removed from the areas that feed into the water sources. The contamination levels in the country's supplies increased substantially after perestroika and the collapse of the Soviet Union. In 1985, for example, about 15 percent of the samples drawn from drinking water sources exceeded regulations, and that year "was one of the top industrial years for the Soviet Union," Blokov said. By comparison, the state's figure for 2010 was 28.9 percent, he said. He trusts the figures published by Federal Consumer Protection Service officials because "their pay doesn't depend on the outcome of the tests." He acknowledged, however, that it is possible that the reports could come under political pressure. The poor test results of the water supplies is an environmental red flag, Blokov said. "It's already a bad signal," he said, comparing the compromising of water stocks with bad meat sold at the market. "You don't want any contamination," he said, even if it will be treated before use. It is possible for consumers to improve the water that comes out of the faucets, but only to a certain extent. Boiling will kill off microorganisms, and experts ranging from the Sysin Institute's Mikhailova to travel experts suggest boiling the water from one to 10 minutes. Removing chemicals from the water can be a more difficult matter, however. Activated carbon filters will remove some chemicals. Yet store-bought filters or systems for the home aren't guarantees, said Sarah Bell, a senior lecturer in environmental engineering at University College London. An expert on urban water systems, Bell said that the filter, the type of the chemical — whether it is toxic or radioactive — and the concentration of the chemical all affect how much of the substance can be removed from tap water, if at all. It is a challenge even for municipal water systems with expensive technologies to take out all of the contaminants, she said, and a home filter ranks far below those systems in complexity. What's more, "one of the problems with doing anything on a household basis is the level of control and the level of monitoring," Bell said. That means that a sudden surge in microorganisms or chemicals might render the filters less effective or useless and that variations are unmonitored, unlike in a treatment plant, where samples are taken. The cleanliness of the water supply, or lack thereof, is a major issue in maintaining a good system. "Anything that's polluting the environment is polluting the water and polluting the water supply," Bell said. It is much easier to prevent pollution from entering the watershed than to remove it from the drinking supply, she said. "That comes down to legislation and enforcement," she added. "You have to protect the whole catchment" for the supply, she said. Livestock and their wastes, the agricultural industry and its pesticides and fertilizers and industrial sites all should be kept separated from the supply, as should waste water. In addition to the original water supplies and the treatment plants, plumbing in apartment buildings also has an effect on the taste and cleanliness of what comes out of the faucet. Dilapidated apartment blocks sometimes have pipes that haven't been replaced for decades, seeping chemicals and sometimes adding microorganisms into the water. Nikolai Rybakov, executive director in St. Petersburg for international environmental group Bellona, said that water all throughout Russia is contaminated as it flows through a building's plumbing systems. Individual consumers have their own views on tap water. Sergei Sergeyev, for example, is not a fan of water from the faucet. "Drinking it in Moscow is not doable," he said as he was hanging out with friends outside a fast-food joint near Pushkin Square on a recent evening. Because of the taste, "drinking from the tap isn't worth it," he said. Instead, the 28-year-old musician likes to buy Shishkin Les, a domestic brand of bottled water. That's also the brand preferred by Pavel Voronin, who was headed down the street with teenage friends. Voronin's family uses a water cooler at home. Sasha Belaya, paying for a cup of tea at a kiosk on Tverskaya Ulitsa, sheepishly admitted that she drinks straight from the tap. Both the 19-year-old and her 20-year-old co-worker Vera Lazurenko said their workplace provides a cooler for employees.